It’s finally time to get into the good stuff! In this post we’ll be looking at enemies and how they get set up, run through, and knocked down. We’ll look at how I’ve created some JSON metadata in the map JSON file to set up the types of enemies the map will contain, the sounds to use for those enemies, the different enemy groups that can be in a single wave, how those groups are defined, and how individual enemies are created inside those groups. Let’s take a quick high-level view at how I’ve structured my data and my classes. We’ll get to the actual JSON in a sec. Before you start, feel free to check out the finished product of my AS3 Starling TD Demo. You can also find all of the code used in srcview. Or you can download the whole project zipped up. When ‘wave1’ spawns, the EnemyManager will check those “groups” which correspond to the ids of the EnemyGroups below. So ‘wave1’ spawns and EnemyManager goes to find EnemyGroup id ‘group1’ and tells it to begin spawning. An EnemyGroup is a collection of Enemy classes (and subclasses) that all share a common set of Waypoints for that map. If you have one road on a map, you’ve probably just got one set of waypoint data, “All enemies walk this path from (10,10) to (100,10) to…” then the above JSON data would be fine for your enemyWaves groups definition. But lets say you’ve got two roads on your map, and so there are two different sets of waypoints, one set is for the group that spawns on the left side of the screen, one set is for the group that spawns at the top of the screen. In Map 2 of my demo there are two roads, and two separate enemy groups. And the above JSON code is used to spawn the first wave. The EnemyGroup designated with an id “group1a” and “group1b” will be spawned when the wave “wave1” is spawned. So we’ve got enemyTypes that correspond to com.zf.objects.enemy.EnemyType.as, enemyGroups that correspond to com.zf.objects.enemy.EnemyEnemyGroup.as, and inside of enemyGroups, enemies that correspond to com.zf.objects.enemy.Enemy.as as a base class. Let’s look at an enemy type excerpt from the JSON. Think of an EnemyType as the metadata outlining a specific sub-class of enemies. All enemies inherit from the base Enemy class. However, the above “enemyA” is going to use a specific sub-class of Enemy, com.zf.objects.enemy.types.EnemyA.as to be specific. Since that’s the “klass” attribute, we’re going to use the EnemyA class instead of the boring, old Enemy.as class. Though EnemyA extends Enemy, so we very much use most all of that class. We’ll see later. So, an EnemyType definition lets us specify an internal id for the type, a name to display to the user for that type of enemy, a class to use for that type, and different sounds which consist of sound states. For example, as we’ll see, at the base Enemy class, when the Enemy escapes/leaks from the map, the base Enemy class will call a function that basically says, “play the ‘onEscape’ sound state if it exists.” So, in the case of enemyA, we’ve defined “onEscape” to be “escape1” so when enemyA escapes from the map, escape1 will play. If I did not include an “onEscape” state for the enemy type, then nothing would play. You’re right though, I could certainly define a base set of sounds for the base Enemy class to default to, but I did not for this tutorial. Line 4 – spawnDelay is the time in milliseconds to wait between spawning each Enemy in the enemies array. So this would spawn an Enemy every 0.8 seconds. Line 5 – wave is the wave id that corresponds to something we haven’t seen yet called “enemyWaveData” that primarily deals with the enemy wave tiles at the bottom of the screen. This wave id allows those wave tile classes the ability to get at this data so we don’t have to duplicate this info. 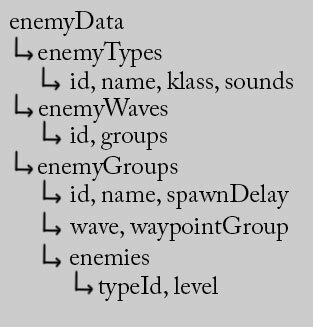 Think of this as a foreign key for the wave tiles to use to get access to a specific EnemyGroup name, number of enemies, etc. Line 6 – waypointGroup corresponds to the map tile data we saw in an earlier post. It means that this EnemyGroup (set of enemies that are spawning from a single point, and all following the same set of waypoint data) requires the set of waypoints created for “wpGroup1”. Line 7 – enemies is our array of individual enemies to define. Each Object listed in this array will be an actual Enemy that shows up on the screen for this group. Each Object consists of a “typeId” and a “level”. Honestly, I don’t know why I have the “level” param in here. In this demo it doesn’t do anything, but if you build on this, this is a way you can create the same type of enemies but have some enemies be tougher/harder/higher-level than other enemies in the group. Line 9 – use this “typeId” which here is “enemyA” and go look above to the EnemyTypes section for the id “enemyA”. This is saying this Enemy should use all the type data defined in the EnemyType “enemyA” data. Line 16-19 – I go on to define 4 more enemies in this EnemyGroup. In the actual map JSON file, enemies are defined on a single line like this to save space. So this EnemyGroup consists of 6 total enemies that will be spawning 0.8 seconds apart from each other. If you wanted a “swarm” level, you may have 30 enemies defined with a spawnDelay of “100” or less! You may want all of your groups to be of the same EnemyType, or mixed types… however you want to do it. The beauty of having all that information in this JSON file is that your designers, or your level editors, or your playtesters can open this file in a text editor and change the number of enemies, spawn delay, types of enemies, etc in every wave. Then they save the file and refresh their browser. This will save them YEARS of time so they can actually tweak these settings themselves and find the right balance. This saves you YEARS of time from having this crap hardcoded and mister level editor has to have you recompile a new SWF every time he wants the enemies to spawn “just a little faster”. You don’t know if that’s 200ms faster or 500ms faster so you split the difference at 375ms faster and he really meant a second faster. You find that out 4 builds later when he just says “can you just make it one second faster?” With the data in the file, everyone can take care of their own tweaking. My enemy graphics were taken from a spritesheet that can be found here. I have contacted Flipz, the artist who created the tilesheet, and he was cool enough to let me borrow his images. This is the entire base Enemy class file. We’ll go through it step by step below. I’m going to try to cut it to ~100-line chunks to make it easier to digest and please remember my formatting is jacked up so we can see more of each line, and my doc blocks have been removed to save space. Line 21-22 – defines the constants for the possible sound states. I only have two here. You could easily add an onSpawn, onDamage, etc and match those keys “onBanish” up with the metadata discussed earlier in the EnemyType “sounds” section. Line 35 – onBanished is a Signal that is dispatched when this Enemy gets killed, before it is removed from the stage. Line 65 – gives this Enemy class a unique ID, REALLY helpful when debugging and you need a specific instance name to log who got shot by which bullet. Line 69 – change the animation state of this enemy to “enemyRight” which is just an arbitrary default I set. Line 60-65 – subtract the damage from _fluxHP then see if it is at or below zero to see if the next shot will damage this Enemy. If so, send back true. Line 69 – remember the “sounds” array from the EnemyType JSON data at the top? Here is where we process that, setting _soundData with the state as the key, and the sound ID as the value. Line 79 – change animation states to the waypoint’s nextDir property. These sync up with the waypoint direction constants at the top of the Enemy.as file. Line 88 – since this Enemy escaped, if we have defined an “onEscape” sound state for this guy, then play it. Line 94 – dispatch that this Enemy has be banished and send this Enemy as the data for that Signal so other classes know exactly which enemy died and they won’t have to waste time checking obituaries. Line 3 – call our SoundManager class’s playFX function passing the sound id to play and the current sfxVolume from Config to actually play the sound. Line 7 – this sets up our animation data. This, again, is another technique I found off of someone’s site! I wish I had bookmarked all of these things so I could give credit! Line 11(again) – so we’re filling _animData Object with a series of MovieClips by the direction state key. I’ve named my files very specifically for this exact setup here. For example, all of the enemy-moving-towards-the-Top-of-the-screen animations are labeled: “enemies/enemyA_t_01”, “enemies/enemyA_t_02”, “enemies/enemyA_t_03”, and “enemies/enemyA_t_04” so that I can do exactly what we see here. I should’ve done a better job of pointing this out, but, _animTexturesPrefix is actually not instantiated in this class. It is up to the child classes to set that as we’ll see in the next file. This was good OOP in theory, but poor OOP in execution. EnemyA.as sets “_animTexturesPrefix = ‘enemies/enemyA’;” so you can see that EnemyA would call the enemies/enemyA part and this would add the _t_ so all 4 of those files would get picked up by Assets.ta.getTextures. Then I’m passing in _enemyGameSpeedFPS to the MovieClip for the FPS property. This part I added because if that _enemyGameSpeedFPS is a constant, when you speed the game up to double time, and the animation is still looping at 6 fps, it looks weird moving at twice the speed. So later I’ll point out setting that. Line 20 – if we try to change the state to the exact same state that currently exists, we don’t want to waste cycles pull stuff from the juggler and adding stuff in if it’s exactly the same. However, if we pass in forceChange == true, then we want to change out the data no matter what. Line 23 – _animState will be ” if it has not gone through these functions and set itself up, so if _animState == ” then there will be nothing to remove from the Juggler. Line 55 – updateSpeed gets called from child classes. For example, EnemyA.as calls _updateSpeed(1.2) so the child class can set the parent class’ speed property, then call setInternalSpeeds so that value propagates out to the FPS speed and such. I could’ve also done this just calling speed from the child and then calling _setInternalSpeeds() but I just wanted one function to handle both. So now that we’ve discussed the base Enemy class, let’s look at how freakin simple it is to make more enemy classes. *OOP Note* in this example tutorial/demo, I’ve created a subclass and all it does is change some properties of the parent class. This is pretty bad OOP. If all I am doing in a subclass (in this tutorial) is changing the speed of the Enemy, and the texture prefix, I should just pass those in to the parent class, Enemy’s constructor. var enemy:Enemy = new Enemy(speed, texturePrefix); and then do things that way. However, I chose to go the subclass route because I’m already working on more in-depth actual subclasses with new functionality in my other personal game I’m working on. So… just wanted to get that out there that I realize this is an excessive/unnecessary use of hierarchy for this specific demo. Yup. That’s it! All of our Enemy subclasses can be that short of a file. Thanks, OOP! Line 14 – I’ve overridden _setupAnimData() function for the sole reason of changing/setting the _animTexturesPrefix var and then I call the parent _setupAnimData() to actually do all the work. I do even less in this file. EnemyB just inherits Enemy’s default speed of 1.0. This makes EnemyA slightly faster than EnemyB. With the Enemy class (and subclasses) out of the way, let’s look at the individual pieces that come together to help Enemy. We’re going to look at EnemyType. and EnemyGroup.as. After we finish both of those files, we’ll look at EnemyManager.as to tie everything together, then we’ll head out for a beer. Line 16 – heads up… I’ve just passed fullClass the fully qualified class name for this EnemyType. Line 21-22 – PROTIP! Here is the key to allowing you to create classes from Strings in JSON data. Flash’s compiler is so selective of files to include that even if you’ve included EnemyA.as in the project file structure, and even if you explicitly type “import com.zf.objects.enemy.types.EnemyA;” into 50 files, unless there is at least 1 actual class defined as type EnemyA, it will never include your file and you will run into errors at run time that Flash doesn’t know what class you’re talking about. But you’ve imported the file? Flash doesn’t care. So in one place in your game, you have to define a variable with your enemy type and Flash will include those classes. If I add 10 more Enemy types… EnemyC, Enemy10, EnemyFlying, etc, I will always need to come back to this file and add a “private var _whatever:EnemySomeType;” so that Flash knows I mean business when I’m importing that class. I’m not just importing enemy classes all willy-nilly slapdash. We’re game developers! Trim that code up! EnemyGroup.as (com.zf.objects.enemy.EnemyGroup.as) is a bit more involved, but still under 100 lines of code. Line 61 – when the spawn timer ticks, dispatch an event that it’s time to spawn a new Enemy, then pass it the enemy pop()’ed from the enemyObjects and also pass along it’s waypointGroup info. Little TimmyEnemy is ready for the bunny slopes and needs his pass… send him on his way. Line 65 – the spawnTimer has finished and is complete, set isFinished = true; If your game was set up so that as soon as one wave was finished spawning, you could spawn the next wave, that logic might go here… another signal to dispatch enabling the Next Wave mechanism or something. Line 2-8 – get the length of our enemies array, loop through enemies looking for the Enemy instance that was passed in, when we find it, splice it out of the array, destroy it, remove it from parent, stake it through the heart, leave it in the sunlight… I dunno, whatever destroys the Enemy for good! Line 33 – play the ding1 sound for when a new wave is spawning. Line 39 – enemyType.fullClass looks like this “com.zf.objects.enemy.types.EnemyA”. This line takes that full class path/name and passes it into Flash’s getDefinitionByName() as a Class, we enclose it in parens and then call the function (); at the end. This is the sorcery that allows us to use Strings for class names and Flash will be cool and create the Class for us. Line 49 – then reverse the enemyObjects array so the last created enemy is actually last in the array. There we go… That’s the full run-down on Enemies in my code! Don’t forget to check out the HealthBar class I made! It’s pretty simple, just some rectangle drawing code. As always, feel free to check out the finished product of my AS3 Starling TD Demo. Thanks for reading, I hope this was helpful! Good blog you have got here.. It’s difficult to find high quality writing like yours nowadays. I really appreciate individuals like you! Take care! !